June’s Recipes for Life challenge has been making me very hungry. All month long, tempting images of delicious pasta dishes have been popping up on my Twitter timeline or arriving in my inbox. The challenge this month was to cook simple, healthy dishes with salmon, courgette (zucchini) and pasta. So what did you come up with? Martin, aka Spurs Cook, kicked things off with his attractive Salmon and Prawn Fishballs in a Tomato and Courgette Sauce . The fish balls are served in a rich tomato sauce, flavoured with basil and garlic, giving the salmon and courgettes some ‘show time’. As ever the photography from Elizabeth’s Kitchen is just exquisite, and these pictures of her Foil-baked Shetland Salmon with Orzo & Courgette Ribbons are no exception. The courgette ribbons are a simple way to create a very sophisticated and elegant looking dish. While it might feature smoked salmon, normally considered a bit of a luxury treat, Blue Kitchen Bakes’ Smoked Salmon, Courgette (Zucchini) & Dill Pasta is an economical and satisfying dish, featuring value brand smoked salmon trimmings which totally suit Jen’s student budget. Helen from The Crazy Kitchen created these simply gorgeous Salmon Canneloni, despite not being much of a fan of fish herself. Helen’s husband was rather happy with the choice of ingredients though, and I’d be more than happy if this was served up for me! Party nibbles weren’t really something I expected to see this month, but these Smoked Salmon, Raw Courgette (Zucchini) and Spearmint Cannelloni Bites from On Top of Spaghetti were a very welcome surprise entry. They formed part of an amazing birthday party spread prepared by Eleni for the The Mister, and I love the sound of the minty, lemony flavour combination. Carbonaras are rather popular at Chez Foti. Here at Bangers & Mash, we’re rather partial to Louisa’s sausage and courgette carbonara. For this challenge, Louisa has come up with a Smoked Salmon and Courgette Carbonara, which looks all set to become another family favourite for us too. Spurs Cook delivered another very tasty looking dish with his Angel Hair Pasta with Salmon and Courgettes. I like the idea of the salmon with the smoky pancetta – yum! Next is this wonderful Warm Pasta Salad with Courgette & Herbs from Sarah at The Garden Deli. Now as you probably know, Sarah is vegetarian so salmon isn’t an ideal ingredient for her. So we agreed she could enter her salad featuring the other two ingredients, and I’d have a go at making it to ensure it worked with salmon too. And indeed it did. It’s a great mix of flavours, especially with all those fresh herbs. Above you’ll see Sarah’s version sans salmon, and mine below avec. I had to play a little with the ingredients for my take on The Garden Deli’s pasta salad, as I’m allergic to avocado and my friend’s son, who was over for lunch, doesn’t like cheese, so I tried disguising it by grating it and letting it melt in, rather than serve as shavings on top. I also left out the chilli as I was cooking for kids, but next time it’s definitely staying in! This Smoked Salmon & Courgette Orzotto from Claire at Under The Blue Gum Tree really looks as pretty as a picture, and having made several of her dishes in the past, I know it will taste every bit as good as it looks. Risottos are usually fairly time-consuming, with all that stirring required, but Claire has used orzo pasta for a much speedier alternative. A beautifully delicious and healthy dish – I can’t wait to make it for my family. Here’s another stunning plate, this time from Rich in Flavour with his Salmon and Courgette Ravioli. I’ve never made my own pasta before, but I think dish might just have inspired me. According to Rich, it’s not all that difficult and is really rather satisfying, plus he didn’t need a special pasta maker either – just a rolling pin. With its creamy salmon filling, this is one I’m definitely bookmarking. Finally, I thought I’d better bring something to the table. So here are my Simple Salmon Croquettes with Courgette & Baby Leek Hollandaise. They really are very easy to make and a great one to get the children involved in making. They love rolling the little fish balls, and their hands are the perfect size. The main ingredient of the balls is tinned salmon, so it’s a fairly cheap and cheerful recipe too. So who takes the winner’s medal this month? It was no easy task to select a winner this time and as ever I was grateful the decision wasn’t up to me. Tracey and the cookery club at SWALLOW had that unenviable task. So who did they choose…? Well, they simply couldn’t decide between Blue Kitchen Bakes’ Smoked Salmon, Courgette and Dill Pasta and Spurs Cooks’ Salmon & Prawn Fishballs in Tomato and Courgette Sauce. Tracey and the team at SWALLOW loved both dishes and thought they’d make perfect meals for the group to have a go at in their cookery lessons. So well done to both Jen and Martin – some little prizes will be coming your way in the post very soon! The three ingredients for July’s Recipes for Life will be announced very soon. In the meantime, if you’d like to find out more about the challenge and the work of SWALLOW take a look here. Wow. Can’t believe what a fabulous array of all very different dishes have been put together using salmon, pasta & courgettes! Many of which I shall be bookmarking. As ever really looking forward to next month’s challenge. Bring it on! You’re going to love next month’s tasty trio, I promise! 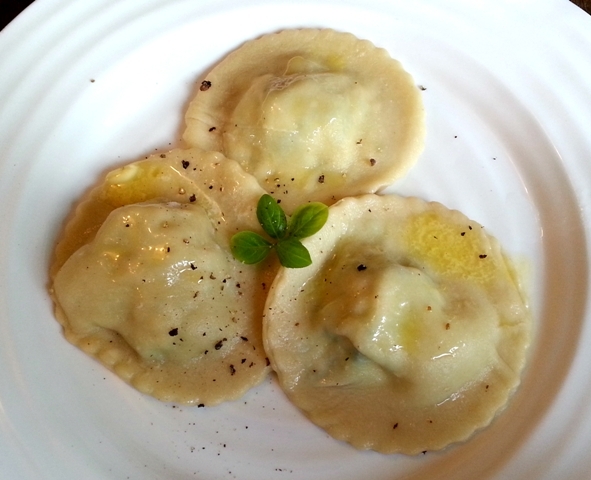 Some great recipe ideas here – I’m especially tempted by the ravioli, with just one change to the ingredients it could make a fabulous vegetarian meal! Another fantastic selection of recipes, as always! Congratulations to the two recipe winners – well deserved Jen and Martin! 🙂 Can’t wait to see what we’re challenged to make next month! These are all amazing! Well done everyone!